For sitter's biography, see cat. no. 31.
around her head like a turban. This headdress embellished her to such an extent that the ladies thought her ravishing. 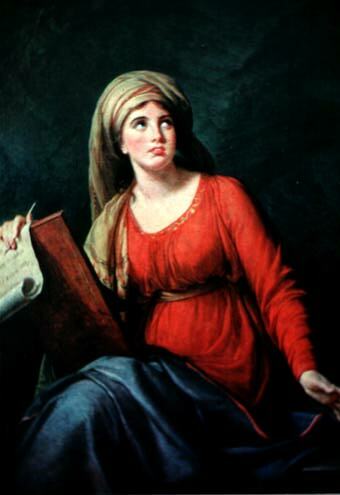 His Lordship having invited us all to dine, Mrs. Hart retired to her chambers to change clothing, and when she joined us in the salon, her dress, of the most common sort, was so disfiguring that the two ladies had every difficulty recognizing her" (Sotiz,cizirs, 11, 93-94). Galleria Borghese in Rome (fig. 38). Although commissioned by the Duc de Brissac, Mme du Birry's lover (a version of the painting was indeed in the Cosse-Brissac collection until 1919 and was later sold in Paris, Galerie Charpentier, March 16, 1959, lot 75), Mme Le Brun kept the original with her until 1819, when she was persuaded to sell it to the Duc de Berry. 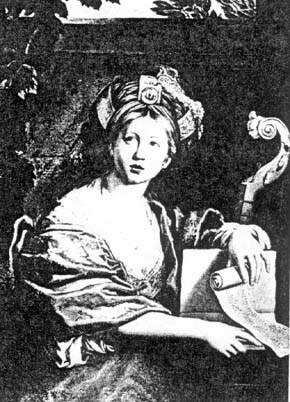 It accompanied her in her travels to Austria, Russia, Germany, and England and was exhibited in her studio as a sample of her best work (see Soiivenirs, II, 158-159, 170-171, 208, 219, 246-247; 111, 107, 139). Its popularity was such that clients like the Russian Princess Dolgorouky (cat. no. 49) insisted on being portrayed in a similar guise. The original canvas, or a replica, was sent to Paris from Saint Petersburg to be shown at the Salon of 1798 (I'an VI). A full-sized version was in the estate sale of the artist's ex-husband, J.B.P. Le Brun, Paris, May 16, 1814, lot 80. A bust-length replica was painted by Vigee Le Brun for Sir William Hamilton and was auctioned off in his sale at Christie's, London, March 27, 1801, lot 28. 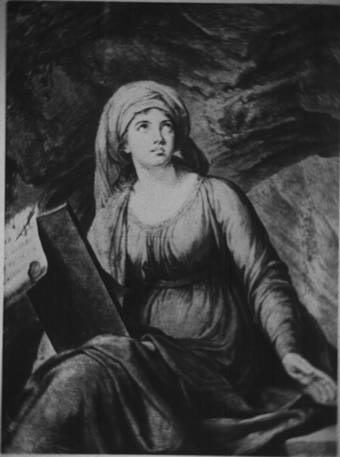 The bust of a sibyl by Vigee Le Brun was in the collection of the artist Menageot at the time of his death (see N. Wilik-Brocard, Francois-Guillaume Menageot, Paris 1978, p. 120). A pen-and-ink rendering appeared as lot 910 in the sale of Baron Dominique Vivant Denon, Paris, May 1, 1826. PROVENANCE: Mme Vigee Le Brun; to her niece, Caroline Riviere, nee Vigee; by family descent to the present owner. EXHIBITION: Tours, Musee des Beaux-Arts, L'Art ancien dans les collections privees de Tottraine, July 12-September 20, 1959, no. 66.